Fort Whyte Eco Village | prairie architects inc. 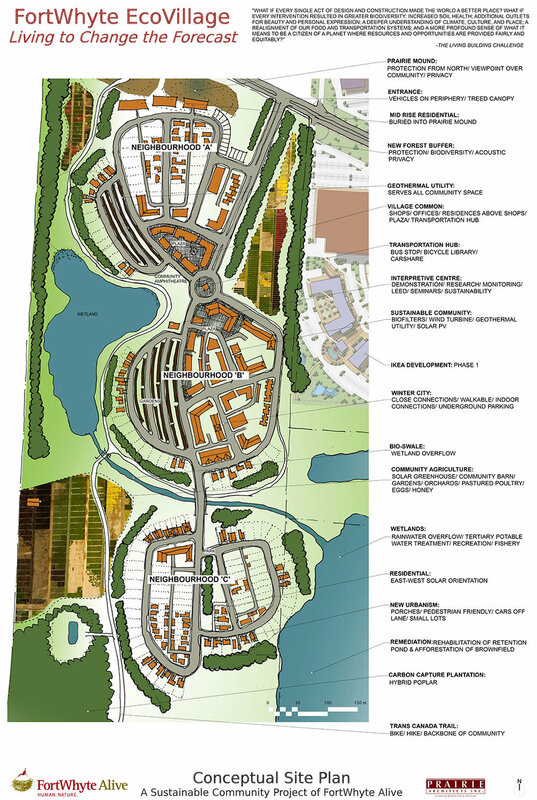 Working with FortWhyte Alive, Prairie Architects Inc. established a framework for an 800 home Eco-village on 80 acres of FortWhyte property in south Winnipeg. The intent for the project was to develop one of the globes most sustainable integrated living and working environments. We proposed utilizing the Living Building Challenge as the framework for sustainability. This framework of 20 imperatives includes net zero water and energy for all buildings, community agriculture, car-free living, habitat exchange, biophilic principles, beauty, and spirit. We established working groups of experts from the City of Winnipeg, the province of Manitoba and Manitoba Hydro as essential members of the integrated approach to the project. We produced and conducted a global RFP for sustainable consulting firms and FortWhyte Alive commissioned a firm from California as planning consultants for the next phase.